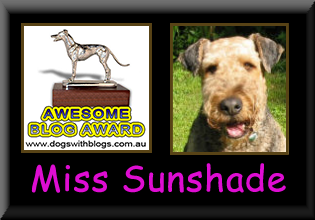 Life of Miss Sunshade - The Vancouver SuperDALE: Airedale Sunday!!! 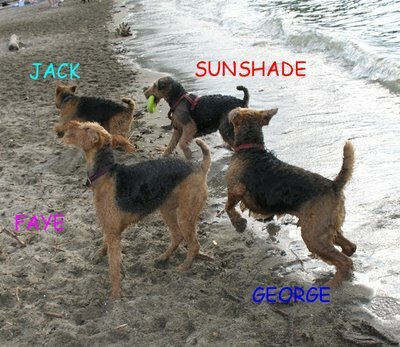 I had SOOO much fun today at Kits Beach with my Aire-buddies!! Here are a few pictures of me while we were waiting for mum's friends to arrive. 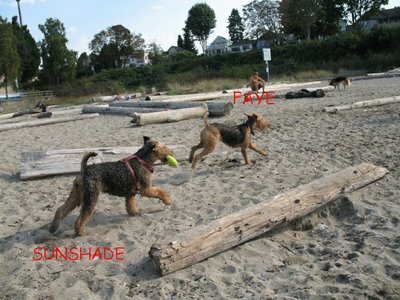 First, I have to introduce my new friend "Faye" to everybody. 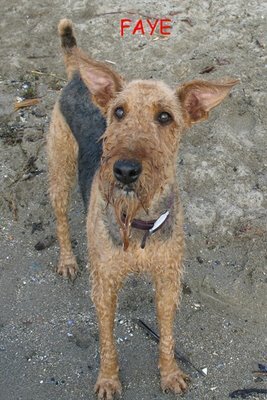 Faye is a very pretty, 2 year old Aire-girl. She was just adopted last week by mum's friends, Ben & Sherrie. 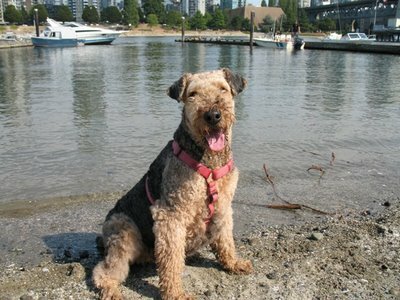 Faye's previous owner had to leave the country and was looking for a new home for her. 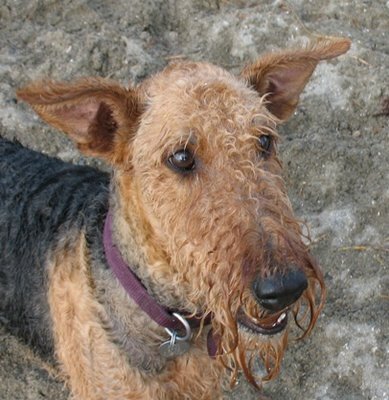 After meeting Faye, mum fell in love with her (and her ears) and convinced Ben & Sherrie to adopt her. 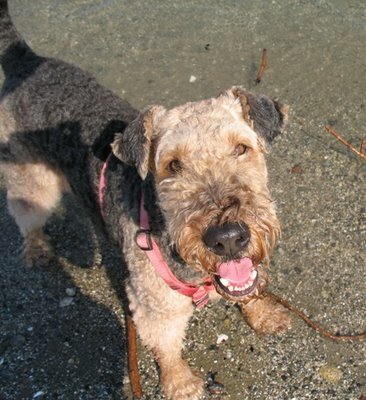 Even though mum's friends had never had a "terrier" before, mum felt Faye's easy going personality (unlike.....um...me...) and sweetness were gonna work out for them. Well, I think mum is correct, because as far as I can tell, Ben and Sherrie are totally in love with their new Aire-girl!! 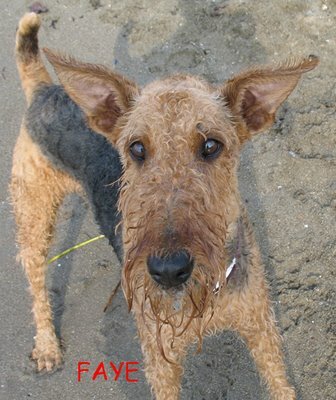 Have you notice Faye's cute radar ears?? They were glued when she was a puppy, but the glue came off early and her ears stood up like a Shepherd. 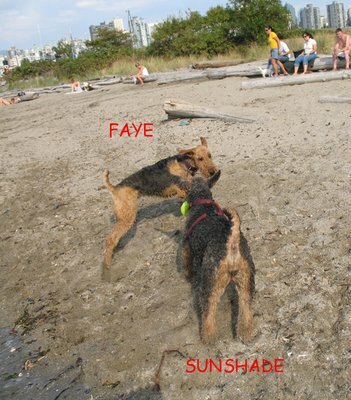 Both mom and I think they are very cute, and make Faye a "uniqueDALE"!! Faye had never been to the dog beach at Kits Beach, so mum, Ben and Sherrie decided to meet up at Kits Beach this afternoon to introduce Faye to the water. Faye was not sure about swimming just yet, especially when the scary waves kept coming in and splashing against her chest. I remember I didn't like those scary waves either when I first started to swim at six months of age. Mum had to swim out so that I would follow her and swim for the first time. Ever since that first time, I learned swimming wasn't so scary, and have loved the water ever since. So Faye just needs to gather up some courage, and have one or both of her parents swim out with her <>!! 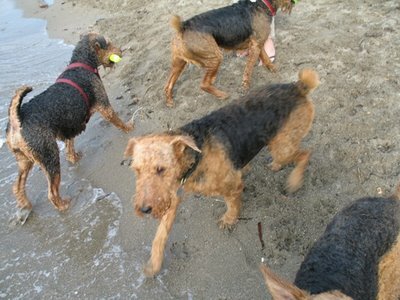 THEN...the dog beach was ruled by Airedales!!! 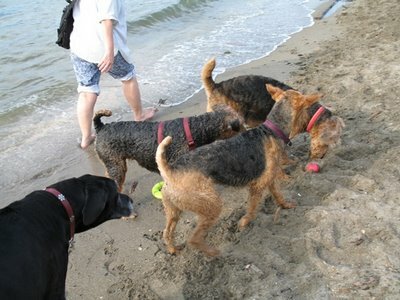 George and Jack, who are both 3 years old showed up at the beach and we all started to play together. 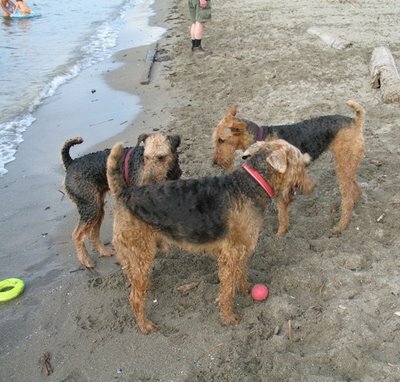 Since Airedales are so rare to see, it is not everyday you can get "4" Airedales playing on the same beach. I was the oldest (7 years) of the four, but I think I did pretty good keeping up with the 2 & 3 year olds!! faye is skinny! and yes, she indeed has a cute ears! but... *don't tell the others* i think you have the most pretty ears among all! nicely cropped! btw, i notice that you always smile for photos. In us wires, they have a special "ear club" for those of us with prick ear or ears! 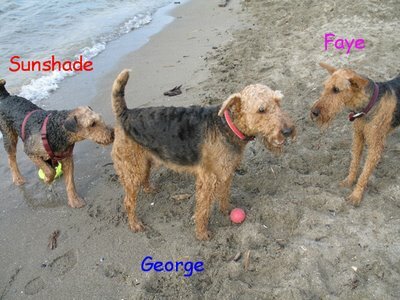 See http://www.foxterrier.com/earclub/ for the pix! It looks like she is a little taller then you, but very lanky! 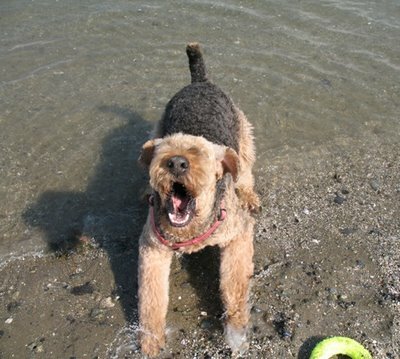 I love the pics from Airedale Beach!! That was nice of you to help Faye learn the ropes. sunshade, i don't mean "cropped! ", i mean nicely bended! I just had to check out who's been visiting my boyfriend T-Man's blog. Surely you have heard him talk of me. I am his supermodel girlfriend. I was going to growl at you but, you seem nice and all. I have faith in Faye, I'm sure she will soon swim for the first time!! BTW...I sense that your adorable little gf is feeling a little...insecure?? Don't worry, T-man is very cute, but I have my hands full with my boyfriends Mackie (WFT) and Bogart (ADT)!! Nice to meet you too, you are very pretty. 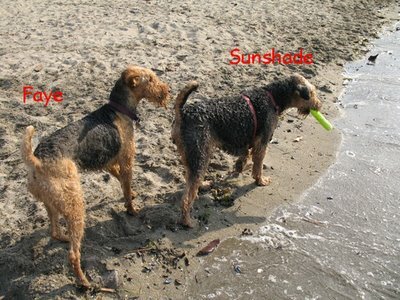 hoy hoy hoy.... Airedales.. .Errr.. .